Learn how to dress for your body type and choose the coolest t-shirts. Our men's style guide gives you an insight into the types of t-shirts available for every body type. We believe a perfect wardrobe doesn’t need to consist of super expensive luxury brands. All it needs is a collection of timeless pieces of apparel. Apparels that can be worn again and over again with the same svelte and can be paired in different ways to create new style ensembles. Such apparels are not only a classic example of sartorial beauty but also make a permanent place in a person’s wardrobe pertaining to its flexible wearability. The T-shirt is one such excellent example of classic clothing. From being a part of the military uniform to then being used as an undergarment and now a unisex fashion must-have, it won’t be wrong to call t-shirt the backbone of fashion. Now the real problem comes when you go shopping a t-shirt for yourself, buy the one in trend and then realize that it doesn’t with your body type. Let’s face it, irrespective of the body types we all have gone through this problem. There are different types of t-shirts having different style characteristics but not necessarily all will fit your body type. There are two ways to make sure the t-shirt you have bought fits you rightly. One is a generic way to ensure that the classic t-shirt fits you aptly. And second is the one which talks about different men’s t-shirt styles that suits one’s body type. The first method is helpful only in case of a classic t-shirt pattern. While the other method focuses more on different t-shirt styles complementing different body shapes. 5 Points to remember while checking t-shirt fit among types of t-shirts. Neckline – The t-shirt Neck types should be loose and shouldn’t constrain neck movements. Sleeves – Sleeves should end at biceps. 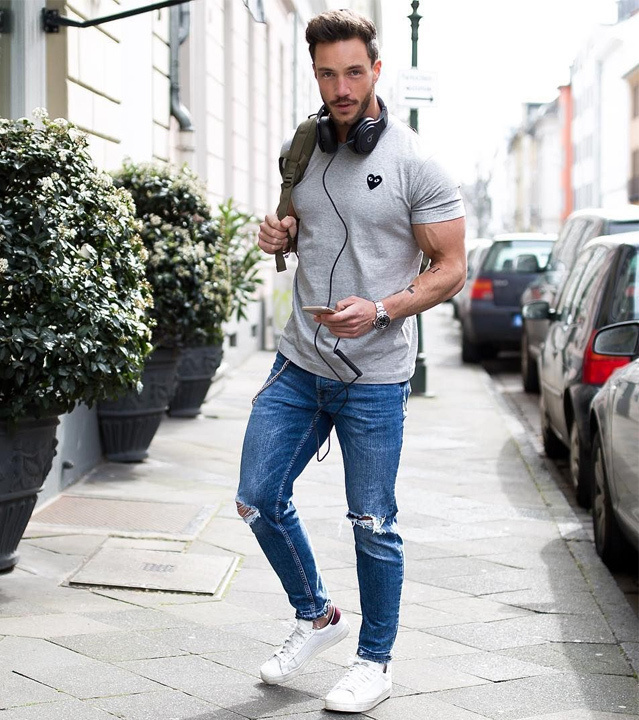 Fit – A classic T-shirt should have a slim fit. Length - Hemline should be at the belt or by mid-fly. Shoulders - Shoulders should end at the beginning of the arm. Check for the above mentioned five fit guide points and be ensured with a perfect classic t-shirt. Although, this fit guide isn’t enough to make sure the t-shirt fits the shape of your body. It is quintessential to know your body type as it helps better choose the right t-shirt types that will complement your overall appearance. So here is your T-shirt style guide to know all the answers to take your dressing style a notch higher according to your body figure type. Look up our t-shirt guide to learn how to dress for your body type. If you are a little bit on the healthier side of a body type and Googling ‘how to fit my body in a slim fit t-shirt?”. Well, you don’t have to. Ditching the usual slim fit pattern of classic t-shirts, a large part of youth is seen sporting a trend of baggy t-shirts. The long, loose and breezy t-shirts. 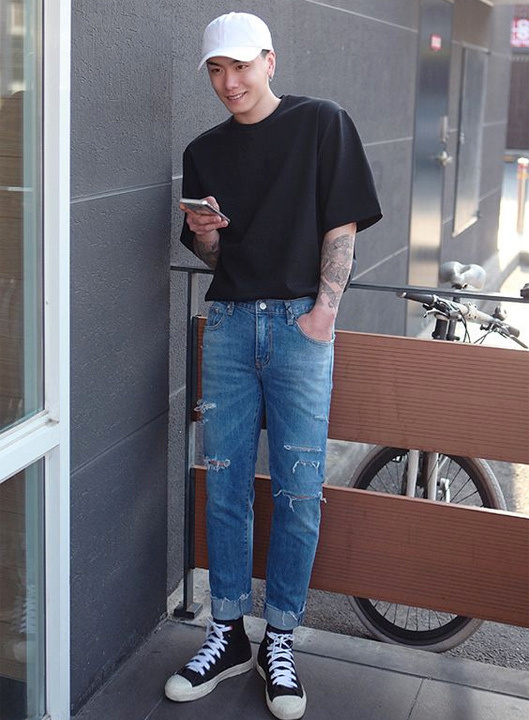 Although, this trend has been made quite popular by the rap artists and the hip-hop artists making these oversized t-shirts trend a popular style in youth audience. 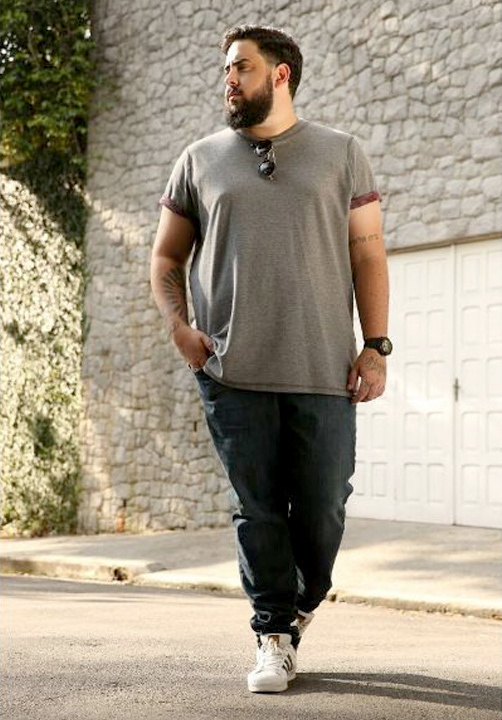 This style fits in perfectly for men with a chubby or broad body type. The relaxed fit and long length add to the ease of wearing. Moreover, it also helps to portray a slimmer appearance. 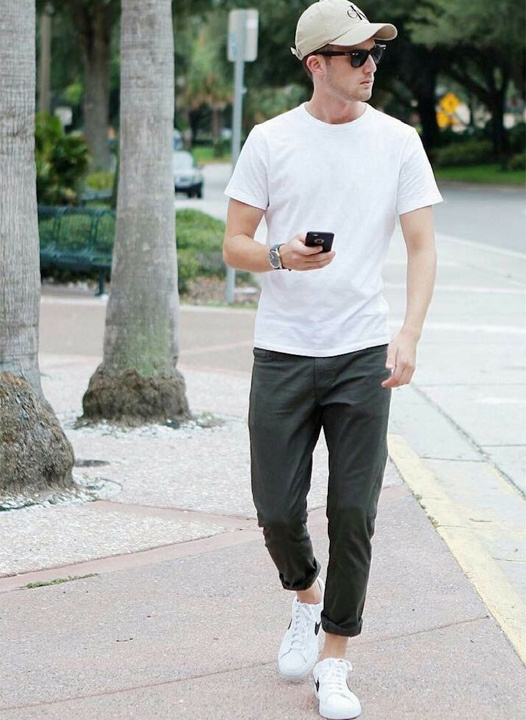 Pairing up the baggy t-shirt with a fitted trouser can create a striking ensemble carrying both comfort and style. Let’s admit when you have got a muscular torso you definitely got to flaunt it. A slim fit t-shirt is a perfect apparel to flaunt that good body shape in style. Now the common question arising while buying it is how fit is slim fit? It is quite simple, it should neither be too short nor too long. A short t-shirt can make you look stocky whereas a long t-shirt can make you appear baggy. Follow the fit guide given for a casual t-shirt and that should help make the right choice. Pair it with any of your favourite pair of trousers or layer it with a dapper jacket to flaunt your toned physique. If you are an athlete and you are looking for a t-shirt that will cast light on your athletic physique, a muscle fit t-shirt with a V-neck is your answer. The best part about V-neck t-shirts is that they are available in various patterns. Also, there are t-shirts with a narrow V-neck and broad V-neck. Although the narrow v-neckline goes perfectly with masculine fit t-shirts. Pair it with a scarf to add a dash of elegance to your dandy ensemble. A slim body shape is something which is admired by many but the one who possesses knows the pain of styling it right. There is always a chance of ending up looking undernourished in such cases. Although, a straight fit t-shirt is sure to give you a relief. The straight pattern and relaxed fit lend it an illusion of proportional width. While the classic crew neck can ensure balanced look. Pair it with a jacket of a shirt to strike symmetry in your look. Also, a suave waistcoat can help you create an elegant dapper look. appearing disproportionate. A boxy t-shirt can help you with this case. Boxy t-shirts are also available with different t-shirt collar styles letting experiment style variations. Its ultra-relaxed fit and boxy silhouette flow on your torso making the shape of your body appear lean and attractive. Pair it with rugged denim to complement your vibrant style. This was your complete guide on ‘how to wear t-shirt’ with utmost style whilst complementing your body type. 8 Types Of Sneakers You’ll Kill For- Know How to Wear Sneakers For Men! 8 Types Of Salwar Suit Design- Be A Trendsetter! 11 Types Of Ladies Bangles That You Should Wear Asap!